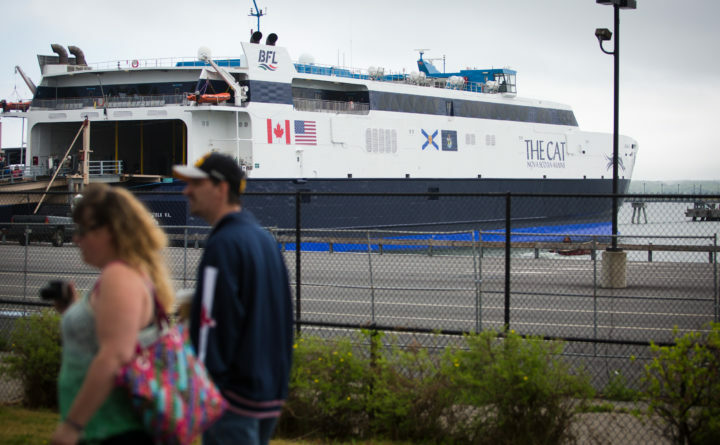 The high-speed ferry known as The Cat sits at the Ocean Gateway Terminal in Portland on June 6, 2016. The legal fight over fees charged to steer large ships traveling in and out of Maine’s busiest port is headed to the state’s top court. On Wednesday, the board that oversees Portland harbor appealed a judge’s ruling that struck down its 2017 vote to dramatically increase the rate pilots can charge to guide large, foreign vessels into the city. At stake in the case are hundreds of thousands of dollars a year in fees from foreign companies that frequent the port — including Bay Ferries LLC, which brought the suit and operates The Cat ferry, and Icelandic shipping giant Eimskip. Board chairman Thomas Dobbins said Thursday that the five commissioners believed that they followed correct procedure in changing the minimum fee pilotage fee, which had long been $709, to $1,077. It will remain at $1,077 while the appeal proceeds, he said. “We’re trying to have a viable pilot service in the port of Portland,” Dobbins said, adding that the board considered the pilot’s expenses, the rates charged in other ports and diminishing shipping traffic in Portland. In his ruling last week, Justice Lance Walker faulted the commissioners for obtaining information about the pilot’s expenses but not their revenue. State and federal law requires that a pilot guide large ships coming from a foreign port in and out of port. Beyond the minimum charge, the cost of this service is based on the size of the ship and amount of fuel used. In Portland two men, operating as the Portland Pilots, handle all of this work. The pilots have said that they’ve come under financial strain and been forced to cut staff in recent years, as the number of tankers entering the harbor to use the Portland-Montreal pipeline has dropped. They requested a rate increase last spring. A lawyer for the pilots, Twain Braden of Thompson Bowie & Hatch, said that the company is grateful that the board is appealing the decision. A lawyer for Bay Ferries, Harold Pachios, a founding partner of Preti Flaherty, declined to comment.